The prestigious Titus Brandsma Award Philippines on Nov. 27 honored multimedia journalist Raymund B. Villanueva for “emergent leadership in journalism”, an affirmation both for the awardee’s brand of journalism and for his growing and empowered audience. Fondly called “Bukaneg” by his friends and colleagues, Villanueva is director for radio of Kodao Productions, itself a multi-awarded radio and production group. He also writes for Bulatlat.com. Villanueva is also former Vice President for Luzon of the College Editors Guild of the Philippines, and served as an editor of The Bedan, the official student publication of San Beda College in Manila. After graduating from the youth movement, he joined mainstream journalism as a business reporter, taught in schools, helped lead a resurgent teachers’ movement, and once contributed his skills to the formal peace negotiations between the Philippine government and the National Democratic Front of the Philippines. But Villanueva never really left journalism and writing. He is an avid reader, essayist, poet, and photographer. He would soon add radio broadcasting to his competencies. As one of the pillars of Kodao Productions and a regular contributor to Bulalat.com, he would pick and choose any combination of his competencies to do good journalism the news the public wishes to see and read: news that actually matter to them. 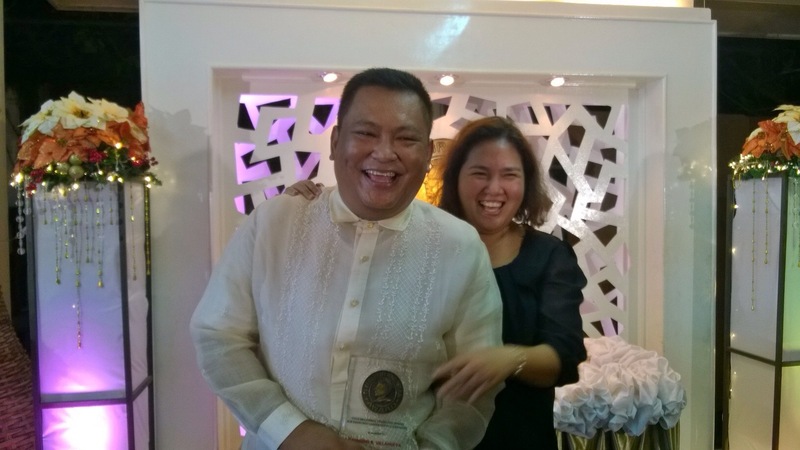 Just last month, Villanueva also received a Gawad Agong for indigenous peoples reportage. Villanueva is married to fellow advocate Pom Cahilog-Villanueva. Aside from Villanueva, the Titus Brandsma Award Philippines also feted Gary Granada (for leadership in culture and communication), community journalist Abner Francisco of North Cotabato (for leadership in community communication), Vera Files co-founder Yvonne T. Chua (leadership in journalism), and Rev. Frank Jose Eilers (for leadership in social communications). Members of the jury for the 2015 Titus Brandsma Award Philippines were: journalist, editor and teacher Carolina “Bobbie” Malay; Carmelite Prior Provincial Rev. Christian Buenafe O.Carm. ; University of Santo Tomas Prof. Anthony Roman; Human Rights Defenders-Philippines chair Renato Mabunga; journalist Christian Esguerra; Asian Institute of Journalism and Communication president and dean emeritus Prof. Florangel Rosario-Braid; and Rev. Carlos Lariosa of Radio Veritas. Named after a legendary Dutch Carmelite priest and press freedom champion, the biennial Titus Brandsma Award Philippines recognizes Filipino journalists and community media, and honors “modern-day prophets and martyrs for the freedom of the press”. It is initiated by the Order of the Carmelites in the Philippines through its media ministry, the Titus Brandsma Media Center. Villanueva’s acceptance speech entitled “Witnessing with the poor” captures the story of why he chose to be a journalist and for whom. Magandang gabi po sa inyong lahat. Thank you very much, Titus Brandsma Award Philippines Board and the Order of Carmelites for this affirmation. I am much honored to be one of 2015’s awardees, more so as we observe the Year of the Poor. I started as a campus journalist. But this work really began sometime in 1993 when I volunteered to be the photo-documenter of a human rights fact-finding mission in Pako Valley—part of the notorious tri-valley complex in what is now Kalinga Province. I thought I knew what I came to do as I could take photographs and I could write. Little did I know then that my real education was just about to start. Of the more than 50 families that were residents of this remote village, only 12 were left. The rest either evacuated or were killed by the Philippine Army. I photographed abandoned huts and farms; I photographed bullet shells clustered around skeletons of carabaos; I interviewed Itneg children who could only sing about the blood-thirsty soldiers but could not bring themselves to talk about them. Later, I had to pilot a hastily-built bamboo raft so we can outrun a platoon of Scout Rangers based in Conner town who were hot on our heels. I repeatedly crashed our raft again huge boulders in the middle of a raging river and all but one of my film rolls was lost. The photos that emerged from that single roll were used by human rights organizations to tell stories about an indigenous tribe who to this day suffer from military atrocities. Whenever I am asked how I started to be an alternative journalist, photographer and broadcaster, I look back at this human rights mission as my starting point. After serving my term as vice president of the College Editors’ Guild of the Philippines I became a broadcaster, a teachers’ right advocate, a business reporter, a human rights defender, and peace talks worker. When progressive multi-media outfits were being established at the turn of the millennium I grabbed at the opportunity to do what I have committed myself to do while piloting that bamboo raft on a rampaging river—a river that may just as well be the cumulative tears of the poor and marginalized of our beloved and terrible country. Since then I have participated in missions and reported on the Maguindanao Massacre, the Capion Massacre, the Burgos-Cadapan-Empeño-Meriño-Robiños-Batralo-Manalo desaperacidos cases, the Lumad massacres and forced evacuations, the Manilakbayans, election killings and many others. For these, we have been red-tagged and charged with rebellion by the Armed Forces of the Philippines and our radio programs discontinued. Our alternative media outfits have been vilified and attacked. All these are scary reasons to be a journalist, but I could not find better justifications to be one. So I persist. I believe they should. The poor and marginalized must themselves be their own voices. We are now are committed to helping them claim their communication rights. They own the memories and the stories; they—more than anyone else—should be the ones to tell them. We helped in the establishment of the peasant-led community station Radyo Cagayano in 2006. The Philippine Army burned it down two months into their broadcasting. In 2012, we helped in the establishment of Radyo Sagada—the first and only indigenous peoples’ community radio station in the country. We are now establishing an urban poor disaster risk reduction radio station here in Metro Manila; a women-led DRR radio station in Tacloban; still another IP community radio station in Northern Mindanao with the Rural Missionaries of the Philippines. Plans are underway for yet another DRR radio station in Northern Panay (another Yolanda-stricken region). We regularly train alternative journalists from poor communities, marginalized sectors and neglected provinces all over the Philippines, even alternative broadcasters among migrant Filipino communities abroad, for them to establish their own alternative multi-media outfits. If you notice so-called alternative media outfits being loud you are hearing the people claiming their communication rights, despite the efforts of the dominant media to make all of us mindless consumers of their often irrelevant brand of news and worldview. The poor and the people at the margins are again their own voices. My participation in all these is my life’s work thus far. I am happy that you take notice.